There are the acupressure points for stopping Fainting and Dizziness. Working on these points can help you get better quicker. You do not have to use all of these points. Using just one or two of them whenever you have a free hand can be effective. 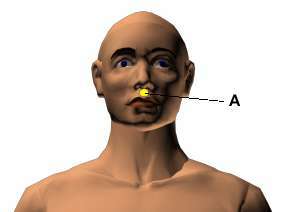 Location: Two-thirds of the way up from the upper lip to the nose. Benefits: This first-aid revival point has traditionally been used for relieving cramps, fainting, dizziness, epilepsy, spinal pain, and extreme emotional agitation. Location: On the sole of the foot in the center between the two pads. Benefits: First-aid point for relieving fainting, shock, and convulsions. 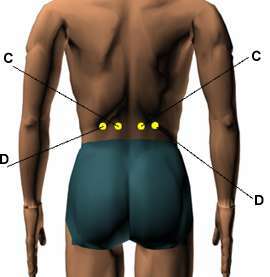 Location: On either side of the lower back two and four finger widths away from the spine at waist level. Benefits: Relieves fainting, dizziness, fatigue, extreme weakness, and instability. 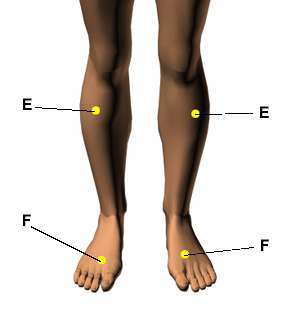 Location: Four finger widths below the kneecap, one finger width outside of the shinbone. If you are on the correct spot, a muscle should flex as you move your foot up and down. Benefits: Strengthens the whole body, tones the muscles, and grounds a person when weak, tired, dizzy, or faint. Location: On the top of the foot, in the valley between the big toe and second toe. Benefits: Relieves fainting, dizziness, exhaustion, headaches, minor nervous disorders, and hangovers.